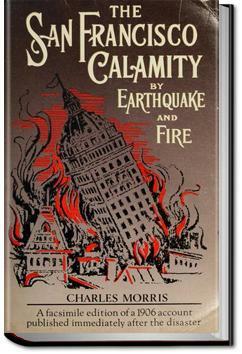 In the second half, a number of different other earthquakes and volcanic eruptions are retold, like the eruption of the Vesuvius that destroyed Pompeij or the explosion of the Krakatoa, together with scientific explanations for the causes of earthquakes and the eruption of volcanos. . . .A number of people were killed in the city. None of the Postal people were killed. They are now carting the dead from the fallen buildings. There are many fires, with no one to fight them. Postal building roof wrecked, but not entire building." The fire got nearer and nearer to the Postal building. All of the water mains had been destroyed around the building, the operators said, and there was no hope if the fire came on. They also said that they could hear the sound of dynamite blowing up buildings. All this time the operators were sticking to their posts and sending and receiving all the business the wires could stand. At 12.45 the wire began to click again with a message for the little group of waiting officials.